BEIJING, Jan. 30 (Xinhua) -- An art troupe from the Democratic People's Republic of Korea (DPRK) paid a visit to and staged performances in Beijing from Jan. 23 to 30. 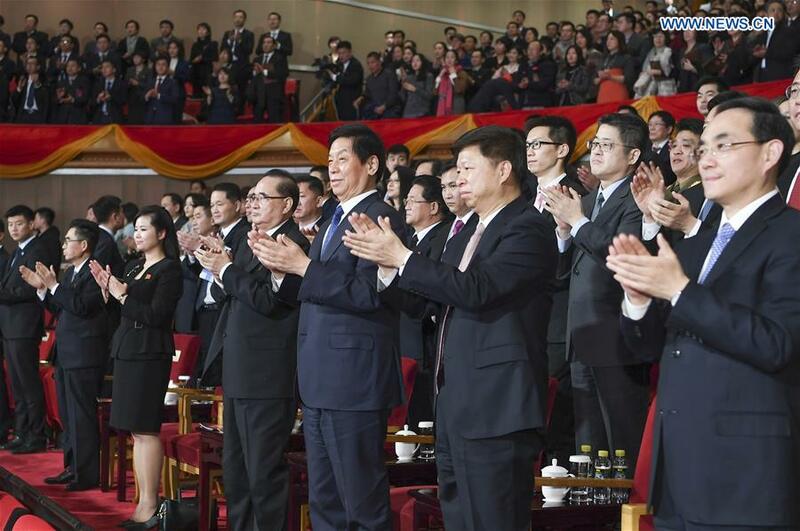 Li Zhanshu, a member of the Standing Committee of the Political Bureau of the Communist Party of China (CPC) Central Committee and chairman of China's National People's Congress (NPC) Standing Committee, together with Ri, watched the performance by the DPRK art troupe at the National Center for the Performing Arts on Monday. Hailing the performance as a cultural exchange activity for implementing the consensus reached by leaders of the two countries, Li said that this visit would further strengthen friendship between the Chinese and DPRK people. The performance, featuring famous and popular songs from both the DPRK and China, as well as orchestral music, won warm applause from the audience. Wang Huning, a member of the Standing Committee of the Political Bureau of the CPC Central Committee and a member of the Secretariat of the CPC Central Committee, met with Ri on Tuesday. Wang said the performance was a great success, marking a good beginning for the celebration of the 70th anniversary of the establishment of diplomatic relations between the two countries. "We are willing to work with DPRK comrades to strengthen people-to-people exchanges and let the China-DPRK friendship go deeper into the hearts of the two peoples," Wang said. Ri expressed gratitude to China for receiving the DPRK art troupe and pledged to continue working with China to implement the consensus reached by the leaders of the two countries. Huang Kunming, member of the Political Bureau of the CPC Central Committee, member of the Secretariat of the CPC Central Committee and head of the Publicity Department of the CPC Central Committee, also watched performance on Saturday. The DPRK art troupe also watched performances by artists from the National Ballet of China and China National Opera House.